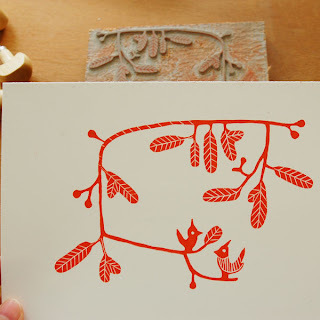 I hope you won't get bored with my carving and letterpress posts. Did the second colors for the swallows.There will be a third colors on it later on. A proof for my thank you cards. I really like this orange but this is not the color I will be using..
oh my god, am I murmuring too much!! Maybe just like my instructor said, I push myself too hard!!! I love that red cabinet and hard edges lines of Bauhaus building. Simply brilliant. i love your designs so much, they are so inspiring! Not bored at all! I love to see your work. It's so inspiring, makes me want to take my carving tools out! I´m not bored either, love! Its good to push yourself hard. I think i need to learn that! i love seeing your process of carving! dont stop! 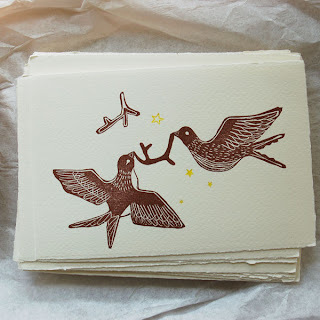 I love the one with the twig and birds, so lovely. And thanks for your info that lines&shapes are now sold at Kei Bun Sha! I always wanted a copy but now it will be easier if I can buy it in Japan!! great! i love the love one, it's wonderful! 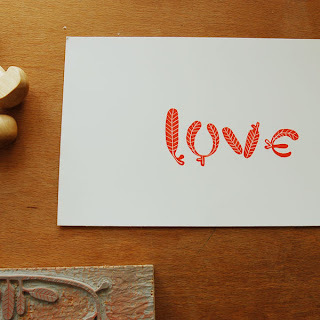 I love love love seeing all of your letterpress and carving posts!! Your linocuts leave me & my sister astounded. Wow! It's also been really inspiring to me since I have recently bought some indian woodblocks for printing on fabric. And am hesitating to use them until I do a bit more research. So it's really great to see your printing efforts. your work is so beautiful! it's truly inspiring..
Magnifique ! I love it ! Lovely prints - so pure and simple. These are just stunning! So glad to have found your beautiful blog, and beautiful work. Would you mind if I posted some of your work on my blog with a link to your shop? I just love it and would love to share the links with my friends. you are welcome to do the post about me or my prints or even my shop, just remember to give them the correctly credits. Ooh, love those swallow prints - brilliant.